“I’ll find out what it is, when it gets here” I thought mid-2013. To this day I still do not exactly know what it is. When I saw it I immediately put in a bid. It’s the kind of phone, I will try to buy if the price is right and of course if it is on not too bad condition. I got it very quickly for a couple of dozen Euros, including shipping. It arrived and I got no further. It was almost totally devoid of markings. A couple of letters at the terminals, the word Futurit on the bakelite, a small paper card with some writing. 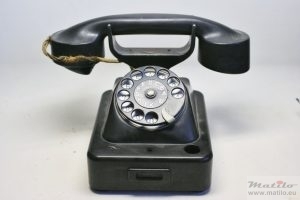 And now, after some 5 years, after asking around, searching the net several times, reading up on related subjects in the hope to learn something useful with regards to the phone, I still do not know what the makers name is, nor do I know what the model number or name of this phone is. 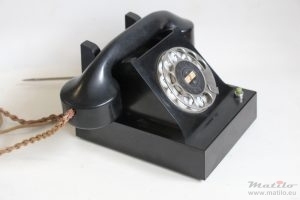 What became clear is that this telephone has its roots in a piece of very dark history. Aside from the lack of markings, the model did look a bit familiar to me. I was fairly sure I would be able to determine what it was. But studying it, I slowly realised that it was an unknown model. The housing obviously draws a lot of inspiration on the Ericsson DBH1001 (aka model 1931). 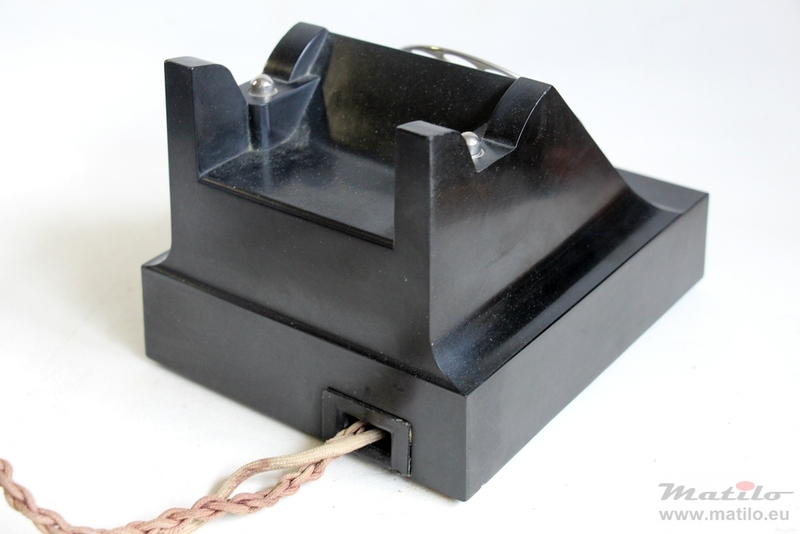 It has a similar integrated cradle, with metal plungers. Also the concave “cheeks” combined with a rectangular block as a base and sloping front are typical. The handset on the other hand is almost identical to a Fuld/T&N (Telefonbau & Normalzeit) handset, as can be found on the Frankfurt (Bauhaus phone) and the Maingau. 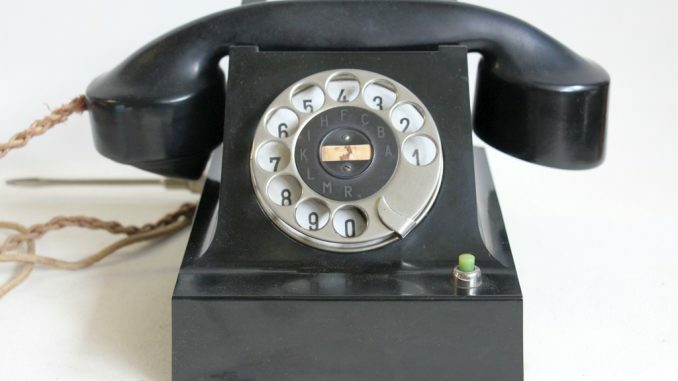 The dial is a copy of a German design, often found on Fuld/T&N telephone as well. 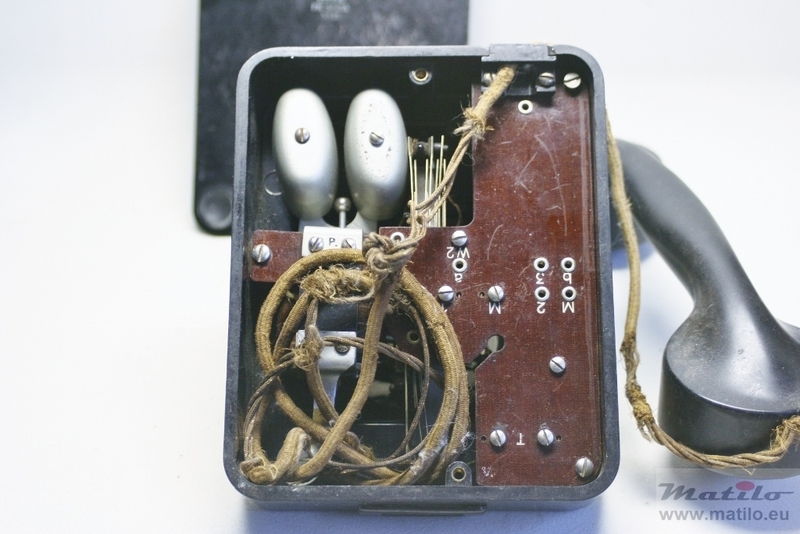 The inside of the telephone is divided by a bakelite panel, which has components of the phone on both sides. Again this is reminiscent of the Maingau, but the Ericsson DBH1001 has a similar configuration where all components are mounted on a metal subframe, rather than a panel. Especially the ringer with its distinctive oval gongs is a direct copy of that of the Maingau 35. Inside the bakelite body shell is the name Futurit, which is a brand name of a bakelite manufacturer in Bratislava, Slovakia. There is also a small paper label, held in place by one of the terminal screws. In says Brün, Kontr 4-4-1940 and has a name and a number on the reverse side. There are letters on the dial centre: A, B, C, F, H, I, K, L, M, R. This letter sequence is unique to the Czechoslovakia area. It was not used in Austria, where they used I, F, A, B, R, U, M, L, Y, Z and the Netherlands (where I bought the phone) where they used A, B, C, D, E, F, G, H, J, K, the same sequence as Germany. 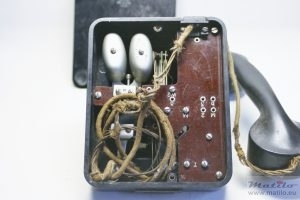 Brün is the first real clue as to the origins of the telephone. Brün is the German name for the city of Brno, in Czechia. Before the invasion of Poland, the German Reich annexed large parts of Czechoslovakia, including Brno. This resulted in the city of Brno being renamed to Brün. Brno was liberated in april 1945 after 2 weeks of heavy fighting. This and allied bombings lead to the destruction of large parts of the city and the surrounding area. Scrutinizing every part of the phone, looking for clues, I found two small makers marks. There was no text or name accompanying them and I did not recognize them at the time. They looked like 2 walking figures. The makers marks were similar but not were not exact copies. They looked like the Zwilling logo, a Swiss maker of knives, and Edna, a Dutch brand of enamel ware. But it was unlikely that one of these was the manufacturer of this phone or indeed the parts with these marks. And then, after a couple of years, during which I made several search efforts to find out more about this phone, I stumbled across pictures of a phone with virtually the same makers mark. It was of a company called Prchal-Ericsson, as the name suggest a joint venture co-founded and party owned by the Ericsson company in the late 30s. They had factories in Kolín, Czechoslovakia, Prague Hungary and of course Brno Czechoslovakia. As far as I can tell they only made Ericsson telephones under licence, before the war. They had no designs of their own. On my telephone however the name of the company is not printed and neither is the starburst surrounding the 2 men. After all these years I am still not certain what the name of the company was that made this phone. It was made in a factory in Brün/Brno that at one time was part of the Prchal-Ericsson company. The question is whether they retained the name, after the annexation of Brno into the German Reich. After all, it appears it no longer had the licence to make Ericsson phones and therefor it is not very likely that the Ericsson part of the name would have been retained. The fact that they designed this new model strongly suggests that they no longer had the licence to build Ericsson models. They did, however, retain the logo or at least part of the logo. 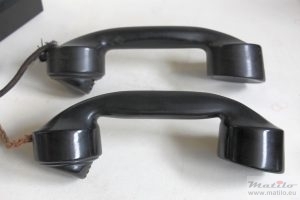 It may very well be that, as is the case with other telephone manufacturers, they used a simplified logo for stamping parts rather than the more elaborate logo used for print work. I assume that after the annexation the Brno factory found itself separated from the mother company and for various reasons designed a new telephone. 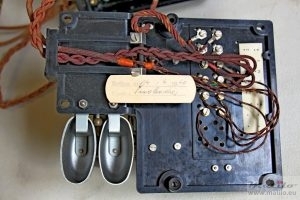 It may be that it was placed in the care of a German telephone producer, as happened with the Belgian companies ATEA (Siemens & Halske) and BTMC (Mix & Genest). This may explain the strong influence of Telefonbau & Normalzeit on this design. So basically all I really know is that it was made in a Brno factory, that once was part of the Prchal-Ericsson company. I still do not know what the model number or name is. For now it is the Prchal model “Mystery”. Do you have any information on this matter? 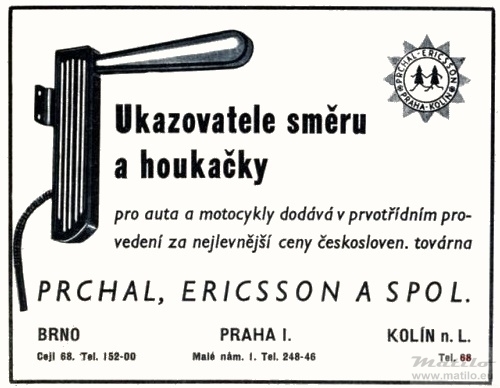 Do you have any information on the history of that Ericsson-Prchal factory in Brno? 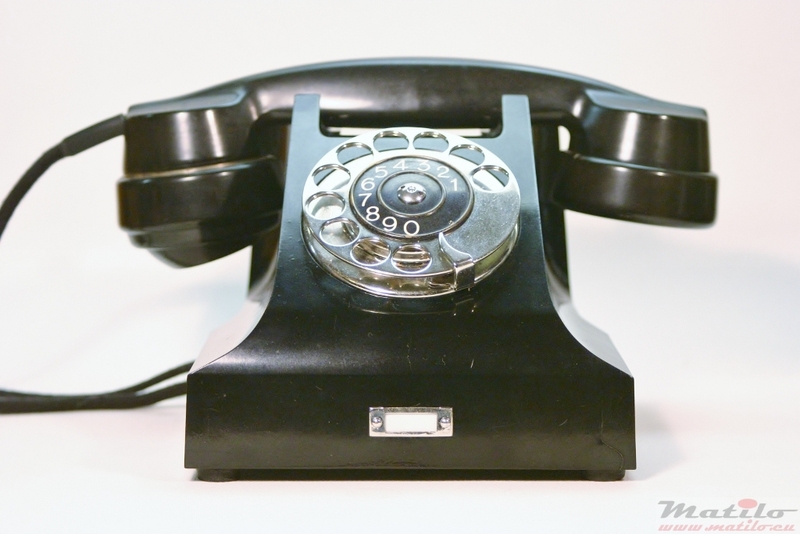 Do you have another example of this telephone? Do you have information on it? Please contact me on j_doubleyou@hotmail.com or leave a comment below! It will be greatly appreciated!